Nearly 1,400 undergraduates registered to vote or requested absentee ballots as part of the College's mandatory online check-in, via TurboVote voter registration software. Students could either register to vote for the first time or request absentee ballots from Aug. 15 to Aug. 30, the period of time when check-in—an online process conducted by Harvard where students are required to verify information about themselves for the upcoming semester—was open. The TurboVote software was added to the process by a collaboration between the Institute of Politics and the Registrar’s Office. IOP administrators and Austin E. Sowa ’17, the vice president of the IOP’s Student Advisory Council who provided the registration figures, worked with representatives from Oracle, which develops Harvard’s check-in software; TurboVote; and the Registrar’s Office to implement the project. This is the first time the College has integrated voter registration into student check-ins, though the IOP has used TurboVote for the last five years. In addition to creating the new voter registration platform, the IOP released a video explaining the TurboVote process to support students registering for the first time. 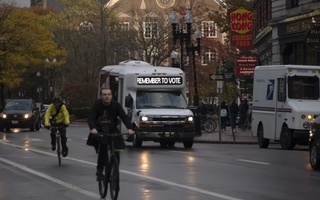 The IOP has a long history of encouraging voting through its Community Action Committee, which works towards registering as many Harvard students as possible. TurboVote is run by Democracy Works, a company founded by Kennedy School alumni Seth E. Flaxman and Kathryn E. Peters. Oracle provides the PeopleSoft Campus Solutions software that students use to check in every semester. Perhaps even more important than Citizens United or iPhone privacy is a system that makes voting as easy as possible for as many people as possible, regardless of race or district.